✔️ Does your baby scream and cry for hours on end for no obvious reason? ✔️ Have you had trouble getting rid of blood or mucus in your baby’s diaper? ✔️ Did your child test negative to skin prick/scratch tests or IgE blood tests but you still feel food is the culprit? ✔️ Does your baby struggle with infant reflux or silent reflux and you want to avoid or get them off medication? ✔️ Does your baby choke or gag while breastfeeding or have frequent hiccups? ✔️ Have you seen some improvement with dietary changes but feel like there’s still a food causing trouble, you just can’t figure out what it is? ✔️ Are you a breastfeeding mom that’s tried an elimination diet (where you only eat a few foods for a period of time) only to find your baby’s symptoms have gotten worse? ✔️ Does your child struggle with behavior issues, attention difficulties, hyperactivity, bed-wetting, diarrhea, or constipation? ✔️ Are you frustrated with doctors not helping or ignoring your concerns? If you nodded your head to any of the above, let us help you. As parents, we’re the best advocates for our kids. We know when something’s wrong and we know when there’s something we can do to help them, but sometimes we just don’t know what that “something” is. Unfortunately, doctors either don’t have the time to work with us on these issues, or they don’t think they’re a big deal. If you’re still reading, it’s likely you suspect food has something to do with your child’s symptoms. And guess what? You’re probably right. Those little immature digestive tracts and immune systems are super sensitive and often need a little extra TLC. Click here for info about food sensitivity testing for adults. The good news? By eliminating trigger foods, we can usually resolve these symptoms, and often in just a couple weeks. Sometimes these dietary changes are permanent, but often they’re just temporary until we can calm down the immune system and/or digestive tract. Most of our clients see a 60-70% reduction in symptoms in the first 2 weeks. So how do we put an end to the never-ending, frustrating guessing game? We use a simple blood test to identify reactions to 150 different foods and food chemicals. We discover what causes an immune response in your child (whether it’s IgG, IgM, IgA, t-cell mediated, etc.) and more importantly, we learn what doesn’t cause an immune response in your child. These foods and chemicals are different for everyone, which is why random elimination diets can be so frustrating. We then use those “safe” (aka non-reactive) foods to build a custom diet for you (if you’re a breastfeeding mom) or your child. (Or both of you.) As symptoms resolve and inflammation decreases, we systematically add foods back in over the course of several weeks and months. This means you or your child won’t be starving or strictly limited for a long period of time. We’ll mail you a test kit. You’ll take the kit to a lab or doctor’s office for a blood draw (we can help you find one, but typically places like AnyLabsNow, etc. will do it for a nominal fee) sometime after 12pm. You’ll include a few forms in the kit, including one that lets us know what foods you don’t eat (so they won’t be included in your eating plan). You’ll drop the box off at FedEx (it’s already paid for) immediately after the test. Your child’s results will include a 60+ page booklet explaining about different foods, food chemicals, eating tips, etc. It’s a huge book. Do Not Panic. You also get a wallet-sized color-coded cheat sheet that reminds you what foods you are the most reactive to. Your child (or you, if you’re a breastfeeding mom) will follow his or her specific diet (usually 20-25 foods) for about 2 weeks, then check back in on his or her symptoms. We make adjustments and/or start adding in new foods. Most people see a 60-80% reduction in symptoms in these first 2 weeks. Pretty cool, right? You get constant support, no matter what. We’re just an email away. Ready to finally get rid of those symptoms? Scroll to the bottom to grab a program application. For caregivers of infants & kids with food sensitivities: Join our FREE support group. What’s the difference between food allergies and food sensitives? To keep it short and sweet, food allergies are caused by something in our body called IgE. Food allergies are what most of us think of when we think of peanut allergies – anaphylaxis, hives, life-threatening emergency. Food sensitivities are caused by other things in our blood such as IgG, IgM, IgA, and t-cells. They can cause immediate or delayed reactions that include diarrhea, reflux, constipation, eczema, joint pain, mood changes, and more. Sensitivities are notoriously hard to figure out because they can happen up to days later and can be dose-dependent (meaning it depends on how much you ate). We do NOT test for IgE food allergies. I’ve been told food sensitivity testing is inaccurate. What gives? 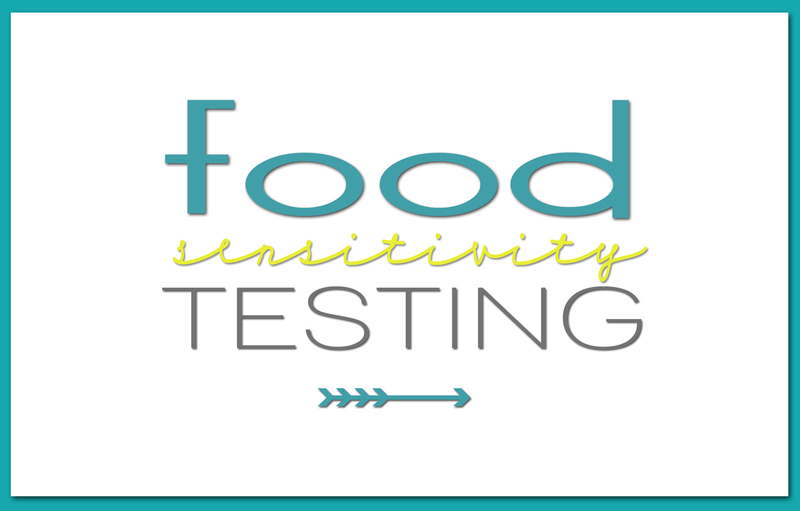 Food allergy testing is pretty straight forward, but when it comes to food sensitivity testing or food intolerance testing, things can get a little murky. Most tests look for the antibody (typically IgG) that can lead to a reaction. Sometimes it will provide a clear cut answer, but often it won’t. The problem is that sometimes IgG can be good – it can be protecting us. Other times it shows up as a “positive” simply because we’ve eaten the food recently or frequently. On the other hand, it can show a “negative” to a food we’ve never had or haven’t eaten a long time. Then we eat that food thinking it’s safe, only to still have symptoms. How is this test different? We use patented functional mediator release testing. Without getting super scientific on you, it tests for evidence of a reaction, regardless of what caused it. It looks for things like histamines, cytokines, etc. You might recognize these words from dealing with environmental allergies (think “antihistamine” drugs). They cause inflammation which can manifest in a million different ways: stomach or skin issues, joint pain, headaches, brain fog, depression, etc. One of the most useful parts of the test is that it tell us what foods are SAFE for us. We start there, ease the symptoms, and then add foods in one at a time, seeing how they make us feel. Plus it tests for sneaky food chemicals as well, like dyes and additives. Does it test for food allergies? NO. It’s very important to understand that this test will not reveal standard IgE food-allergies, although you can still use this test if you have known food allergies. Often people have a mix of allergies and sensitivities. Do I have to eliminate these foods forever? Sometimes, but usually no. Often we end up with so much inflammation in our gut that it becomes “leaky”, meaning it lets all kind of particles through that it shouldn’t. Our immune system then attacks them and we get a reaction. It’s not reacting to that food specifically, it’s just reacting because it knows that item shouldn’t be there. Once we’ve eliminated the problem-causing foods, we can reduce inflammation and let the gut heal, then sometimes we can tolerate many of the foods that used to a problem. Sometimes you’ll choose to keep certain foods out of your diet just because you feel so good. It varies by individually, but most people see a marked improvement in symptoms within the first 7-10 days, with symptoms continuing to improve over the next 4-6 weeks. My infant is breastfed. Can I still do this program? Yes! We test your baby, then have the breastfeeding mother follow the prescribed diet. If your baby is also eating solids, he or she will follow the diet as well. Do you take insurance? We do not, but you can use your HSA/FSA account. We can also provide a superbill for possible insurance reimbursement (but as an out-of-network provider we can not make any claims about whether you’d get reimbursed or not). Payment is due in order to enroll in the program, although we do offer payment plans.